Ideation/Consulting: We started with the core aspects of the Buyvite business model and user stories. In our first conversation with the client, she detailed out a situation that music lovers face time and time again, buying tickets to concerts with friends. Currently, one person has to front the costs in order to buy seats for a group who want to sit together at the show. Buyvite’s vision is to make these and other group purchases as easy on the group and organizer as possible. The infographic is based on this first user story of individuals needing to front money for a group, and the difference that the Buyvite product makes. Once we nailed down the concept, I sat down with a pen and sketched out a storyboard and wireframe that became the physical foundation for the infographic and animated video. Storyboards: Storyboarding was perhaps the most exciting and surprising part of the whole process. We ended up with 99% of our final concept and structure in that first sketch of the wireframe. Once the sketch was finished, we sent it around internally and to the client for approval. That same day, everyone agreed that the idea was golden and ready to go to the designers. 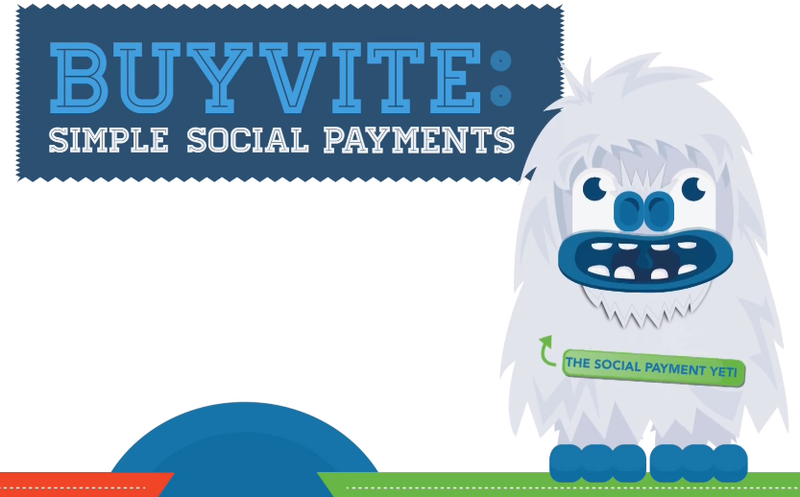 Infographic: The infographic process saw the addition of one panel and a very special character: The Social Payment Yeti. Buyvite had been using a Yeti to do some local promotions of their product on college campuses and thought it would be great to integrate a Yeti into the infographic design. Once we had our concept 100% proofed, we moved forward with the Infographic company who completed the design with their team of professional infographic designers. Their designer specialized in animation and we came out with some very unique characters with lots of personality and charisma, which really came through in the video. Script: The script for the video had basically been written in our early drafts of key points and branded copy that we wanted to include in the infographic. Since we decided to structure the video transitions vertically, like the infographic, we needed only to follow the key points and the character sentiments of the infographic. The script came together quickly and easily. Voice Overs: The voice overs were the most exciting part of the process for me. I’ve been a big fan of cartoons since I was a child, so the characters pretty much voiced themselves once I got a handle on the visuals. A few members of the Oniracom team and myself went to a local recording studio called Playback Recording Studio in Santa Barbara, CA to record the voice overs. We tracked the Yeti narration voice first, laying down the mood and foundation for the entire video project. Once the Yeti was done we moved into major and minor characters until we had enough takes for group and individual character vocals. The final product was professional, fun, and interesting. Animation/Editing: The animation and editing was handled by our video production partner Cool Hand Look. Cool Hand Look was involved in the entire video process from helping to draft and editing the script, to producing the voice overs, to animating and editing the final video. Our team was able to use the vector graphic art from the infographic to create the marketing video. The video went 100% according to plan and the final video and infographic were beautiful, matching marketing materials for Buyvite.com. The client was very pleased with the product which has been shown to investors and tech-industry player with overwhelmingly positive responses. Follow Justin Davis @JustTheDavis on Twitter and Instagram.